I NEED HELP! I have (what I think is) a swarm of bees on my property and need a beekeeper to come get them! Before you call any of our qualified beekeepers to help rid you of your unwanted bees, please read the following information to ensure that what you see is actually honey bees. If you determine they are indeed honey bees, scroll to the bottom to see our Swarm Retrieval List. PLEASE NOTE: Despite our name, we are NOT A COUNTY RUN ORGANIZATION. We are a group of independent beekeepers with no affiliation with any state or county agency. The following are NOT honey bees. Our beekeepers are not qualified to remove these insects from your property. Please call an exterminator. The Yellow Jacket is a stinging insect common to the Eastern United States and is found in medium sized colonies of a couple hundred to a few thousand. The nest is made of paper but is typically not visible. Usually you will only see members of the colony coming and going from a small hole either in the ground or an external house wall. The colony members are small, smooth (not hairy) with sharply contrasting yellow and black colors. If you are stung by a yellow jacket the stinger is not left in your skin since the stinger is not barbed. WARNING - DO NOT ATTEMPT TO CONTACT, HANDLE OR EXTERMINATE THESE INSECTS AND THEIR NEST YOURSELF- A MASS STINGING EPISODE CAN BE VERY HARMFUL OR FATAL! Photo Above - The bumble bee is a stinging insect common to the United States and is found in small colonies of a couple hundred. The nest is made of fibrous material (abandoned mouse nest or birds nest) with small wax pots nested within the fiber. The nest is not typically visible. Usually you will only see members of the colony coming and going from a small hole in the ground. Bumble bee nests are also common within wood piles, under overturned pots and within other yard debris. The colony members are large (very hairy) with sharply contrasting yellow/gold and black colors. If you are stung by a bumble bee the stinger is not left in your skin since the stinger is not barbed. Usually, bumble bee nests can be humanly removed and moved to a less problematic location. WARNING - DO NOT ATTEMPT TO CONTACT, HANDLE OR EXTERMINATE THESE INSECTS AND THEIR NEST YOURSELF- A MASS STINGING EPISODE CAN BE VERY HARMFUL OR FATAL! 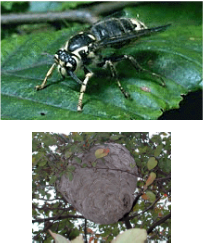 The Bald Faced Hornet is a stinging insect common to the United States and is found in medium sized colonies of a couple hundred to a few thousand. The nest is made of paper and is typically visible. The nest can be as small as a football and as large as 3-4 feet long. Hornets will vigorously defend their nest if you come in contact with it or are perceived as a threat. Not all nests are found hanging from tree branches. Sometimes, nests can be found attached to the underside of external stair units, on the sides of buildings and under porches. The colony members are larger than honey bees, do not exhibit body hair and coloration of a yellowish/white with contrasting black. If you are stung by a hornet, the stinger is not left in your skin since the stinger is not barbed. These colonies can be very defensive! WARNING - DO NOT ATTEMPT TO CONTACT, HANDLE OR EXTERMINATE THESE INSECTS AND THEIR NEST YOURSELF- A MASS STINGING EPISODE CAN BE VERY HARMFUL OR FATAL! The wasp is a stinging insects that is usually found walking upon small (3-4 inch) nests. These nests, however can be quite large (5-12 inches in diameter). The nest is made of paper material and is usually located outside a home (under the eaves) attached to a soffit. These nests are also commonly found up and inside attic and bathroom vents. WARNING - DO NOT ATTEMPT TO CONTACT, HANDLE OR EXTERMINATE THESE INSECTS AND THEIR NEST YOURSELF- A MASS STINGING EPISODE CAN BE VERY HARMFUL OR FATAL! The honey bee is a stinging insect common to the entire United States and is found in large colonies of 30,000 to 80,000. The nest is made of wax but is typically not visible. Usually you will only see members of the colony coming and going from a small hole either in a hollow tree trunk or an external house wall. The colony members are usually larger than Yellow Jackets, are hairy (primarily on their middle body segment) and exhibit a muted gold coloration contrasting with black. If you are stung by a honey bee the stinger is usually left in your skin since the stinger is barbed. 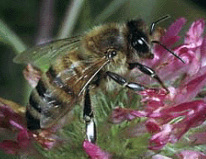 Like most stinging insects, honey bees are beneficial to our eccosystem. Honey Bees can be removed humanly from houses and other nesting sites by carefully removing the entire nest (bees, wax, honey and brood). Additionally, nest removal must be completed to prevent future problems. If the honey bees are killed, they are not present to care for the large nest. Their wax will melt or break/crack and Honey will ferment and seep into your walls. Eventually the smell will attract many other insects causing you bigger problems.